Jurassic Park is an important movie for many different reasons - and I have a lot of personal reasons to stack on top of all of them. And while this isn't necessarily my favorite movie of all time, it is certainly way up there among the most memorable of my life. One of the key aspects to this movie is the fact that this was one of the first times that I had read the full novel that the movie was based on before the fact. In addition, Jurassic Park was also pretty much my very first novel and Michael Crichton one of the first authors that I tried following. And thus this was also my first encounter with reader disappointment - that feeling you get when you start to see just how different the movie is from the original book. All that aside, there's a lot to be said in favor of this movie and the impact it had on the rest of the entertainment industry at the time. And I suppose a lot of us who got to see this movie while we were all fairly young were just happy to see dinosaurs come to life on the big screen in a manner that felt worlds away from what had been done before. 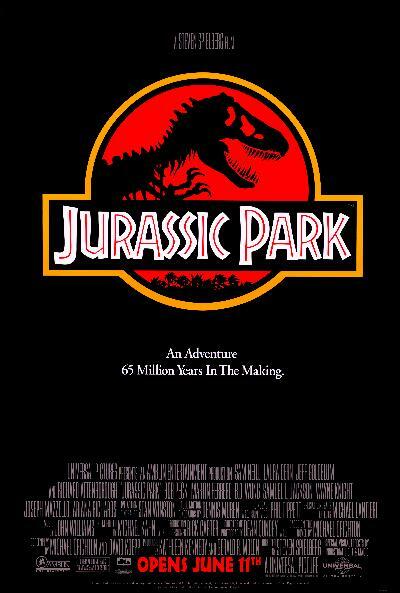 Synopsis: Jurassic Park is a 1993 science fiction action film directed by Steven Spielberg. The story was based on the novel of the same name by Michael Crichton with a screenplay by Crichton and David Knoepp. The movie resulted in two sequels thus far with a new production announced for possible release in 2015. The core premise of the movie is built about Jurassic Park a prehistoric-themed park created by the bioengineering company InGen, as spearheaded by the founder and CEO John Hammond (Richard Attenborough). He had his company have found a way to clone dinosaurs and are preparing to open the park to the public. But after an accident involving one of the park workers being killed by one of the exhibits, the investors behind the park insist that experts be brought in to certify the park as safe. Enter Dr. Alan Grant (Sam Neill), a paleontologist, and Dr. Ellie Sattler (Laura Dern), a paleobotanist, who are the primary experts brought in to study the park. They are also joined by a mathematician named Ian Malcolm (Jeff Goldblum) and eventually Hammond's grandchildren, Lex and Tim (Ariana Richards and Joseph Mazzello). As they go on the formal tour of the park, bad things seem to keep happening just as a massive storm is approaching the island. For the most part, the movie is a brilliant translation of the original book on so many levels. Crichton had put a lot of detail into describing the park and the various aspects of its operations and there was clearly an effort to bring as many of those into the movie as well. The variety of electric-powered trucks and gas-powered alternatives and the various components that made up the park were good examples. At the same time things were certainly sanitized to some extent and a lot of characters who died in the book managed to survive in the movie. The CGI work for this movie was certainly cutting-edge for its time and the quality of the dinosaurs remains pretty impressive even today. I've seen movies with far worse CGI animation involved and it's always interesting to note how this little scrapper of a film from the 90's continues to put such newer projects to shame. Given how much I had enjoyed the novel at the time, I have to admit that I was pretty impressed with the casting choices at the time. I totally saw myself in Tim's shoes, perhaps with a little "UNIX" computer knowledge thrown in for good measure. I can't think of anyone in this movie whose performance didn't quite fit the bill of what was required, save perhaps for the lawyer - although that already gets to the level of nitpicking about things. As much as there were changes between the book and the movie, they weren't exactly bad changes when you really think about it. The end result is a pretty tight narrative that balances the need for dramatic bits, action bits and even little moments of comedy. The movie had a clear vision of the emotional journey that it wanted to take us on and every scene was put together to achieve just that. The musical score was masterfully crafted to make our hearts soar or get us pulse racing as needed. We felt the action just as well as we could see it on the big screens in front of us and I still get a kick out of a lot of the movie's key moments. Jurassic Park is just one of those movies that were done amazingly well that it continues to stick in the memories of anyone who gets to watch it. And maybe my love for it takes things a few notches higher than others, I do not regret going on record to state just how much I enjoyed the movie. Thus I'm more than happy to rate this as 5 clever lines of dialog worked into the story out of a possible 5.